Synchronize Media has released an infographic which has given some interesting research highlights and insights about the OOH (Out Of Home) Industry in Pakistan during the month of February 2015. The research shows that the highest spent in OOH during the month was by the Fashion Industry with net spend of 158 million Rupees. The outburst of lawn collections was followed the Telecom category with 98 million and the confectionery category with 60 million. The reason for this boom in Outdoor Advertising for Fashion Category is due to the emerging trend of many new collections in the lawn industry. Junaid Jamshed and Gul Ahmed are one of the top spenders in the category with spendings of 38 million and 29 million respectively. 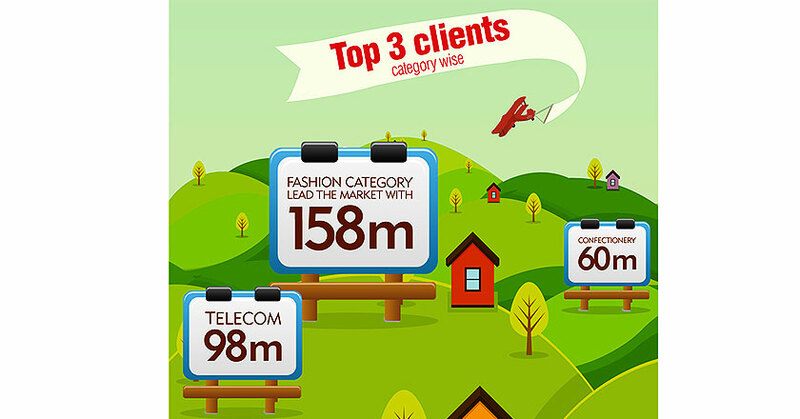 In the telecom sector, the major spenders were Telenor and Warid Telecom. Other major spending brands include Pepsi, Mondelez International, Dairy Milk, Continental Biscuits and Surf Excel. For full details, access the complete infographic here on the Synchronize Media Website.